Lt. General Hamad Mohammed Thani Al Rumaithi, Chief-of-Staff of the UAE Armed Forces, attended the meeting of the Chiefs-of-Staff of the GCC countries, Egypt and Jordan, in addition to the US Central Command, which was held last week in Tampa, Florida. 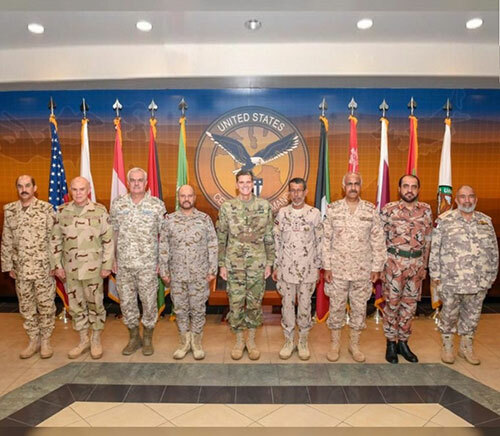 The US Central Command hosted a two-day meeting for Defense Chiefs of GCC nations, Egypt and Jordan, to try to improve coordination and counter Iran. Eight Chairmen of the Joint Chiefs-of-Staff from the attending states and the US, plus a defense representative from the GCC, met MacDill Air Force Base. General Joseph L. Votel, Commander, US Central Command, delivered the opening speech, in which he welcomed the Chiefs, Emirates News Agency WAM reported. The meeting touched on security affairs in the region, as well as means to counter terrorism and extremism. Also discussed were ways to step up joint efforts to overcome the challenges and to ensure regional security and stability. On the meeting’s sidelines, Lt. General Al Rumaithi met with General Votel and reviewed with him bilateral cooperation in military fields. He praised UAE’s progressive relations with the United States. Last month, Saudi Arabia hosted a GCC defense training exercise. The previous meeting for the GCC, Jordan, Egypt and the US was hosted by Kuwait in September, The National reported. US Undersecretary of State for Political Affairs David Hale attended an event with the group. Mr. Hale addressed “the challenges in Syria, Yemen and Libya, as well as countering the Iranian regime’s destabilizing activities and shaping the Middle East Strategic Alliance,” the US State Department said. MESA, also referred to as the Arab NATO, is a security bloc the Trump administration has been hoping to put together since May 2017. The alliance is expected to include the US, the GCC, Egypt and Jordan, and would tackle issues collectively, including defense, security, energy and economic policies. But differences among the members derailed its launch and forced Washington to reschedule three summits. The Florida meeting follows a recent gathering in Washington for MESA representatives and signals an increase in momentum towards launching the alliance. Yasmine Farouk, a fellow at the Carnegie Endowment for International Peace, said the Tampa meeting was another sign that the Trump administration was “still pursuing Mesa actively and refuses to give up on the idea despite recent hurdles”. “The fact that the Arab countries are still attending means that they are actually responsive to the administration’s determination to try to implement this project,” she added. “The US is trying to push Arab countries to be more involved and more active, and some of these countries are now showing more initiative,” Farouk noted. But she said the lack of consensus in defining threats was one of the unresolved issues derailing the formation. Diplomatic sources say there is no agreement in defining the militant, Iranian and terrorism threats. Other issues that have surfaced in the past are defense relations with Russia and China, and energy security. The diplomatic sources said Riyadh would be hosting another meeting for Assistant Ministers of MESA members next month to follow up on Washington’s meeting in February.